A home can never have too many toilets! FACT! Not only will the addition of an extra toilet add value to the property but it will also save you from many awkward situations. Can you think of a time where you had a long soak in the tub without being interrupted? A time where the children or your other half hasn’t needed to pop in to use the loo? No, we can’t either! This relaxing, spa like experience needn't be the thing of dreams. Adding in an additional toilet, be it in the form of an en-suite or downstairs conversion, can be achieved with very little space. When shopping around for your bathroom essentials it’s important to remember that this area is just a toilet, so you won’t have to factor in storage, heating and all the little extras that are needed in your main bathroom. 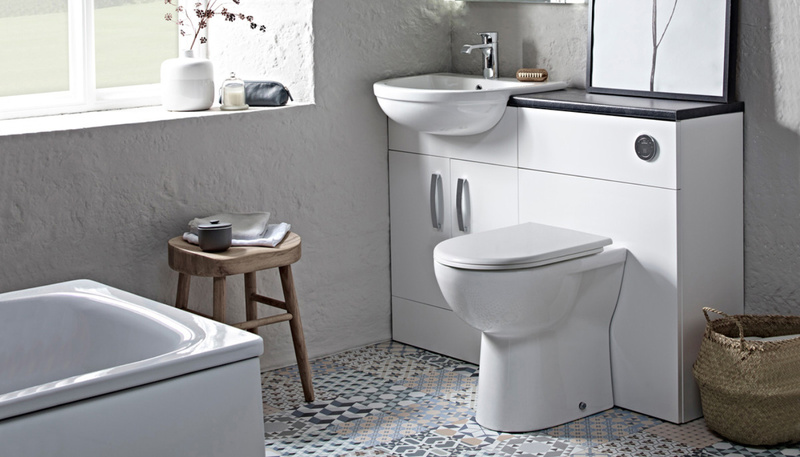 Simply put…a toilet and a basin is really all you need! Now, this is an instance where size really doesn’t matter! Remember, the basin will simply be used for washing hands. No cleaning teeth or having a full body wash here so the smaller the basin, the better it will meet your needs. Whilst storage isn’t something you need to factor in, if you can have some it’s an added bonus. The Sonata vanity unit has been made with cloakrooms specifically in mind. The unit is a slim line 155mm deep, so forget about cramming it full. However, some spare loo roll, soap and hand towels will fit in perfectly. Just remember that you’ll need to allow room for the door to open. The petite basin itself bows out from unit creating an ample space to position hands under the tap. If floor space is limited, wall hung basins are the way forward. With semi pedestal or bottle trap options, you can choose between a wide array of wall hung basins. 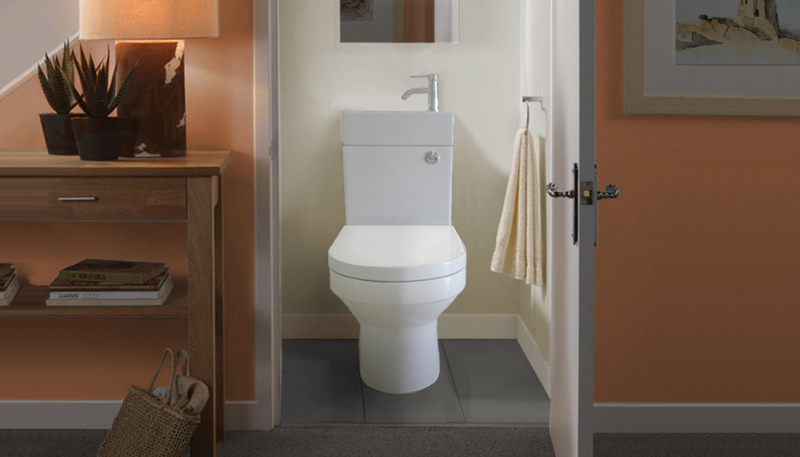 The advantage of a wall hung basin is freeing up much needed floor space for the toilet itself. 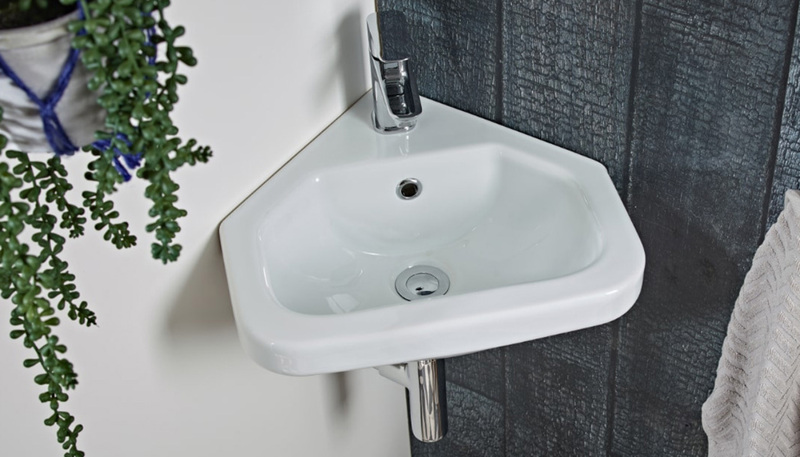 The Tavistock Bathrooms Niche wall hung basin is designed to fit into a corner of the room. This is the perfect solution to an oddly shaped room. In addition to the smaller basin, you’ll also need a smaller tap! The good news is the majority of those available on Bathroom Supastore come as a mini version. Now it’s time to consider the toilet. There are now many different types of toilet available on the market. Gone are the days when you just chose the shape and colour of the close coupled unit. There are now back to wall, wall hung and even corner options. So let’s have a look! 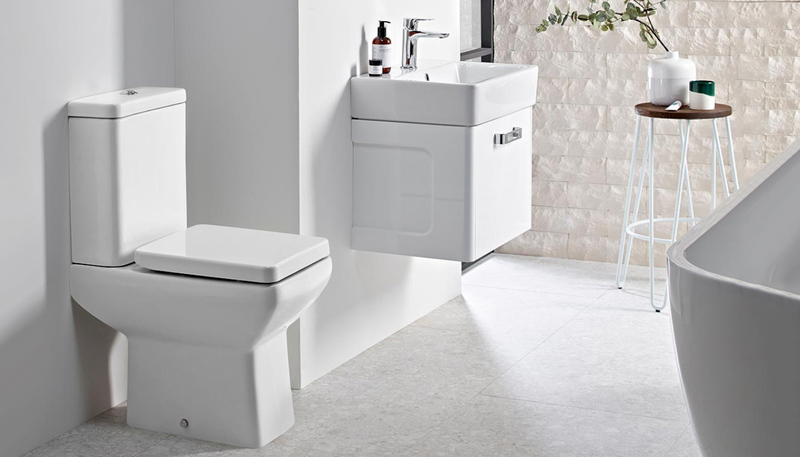 If you’re still looking for a classic close coupled toilet, where the cistern is positioned at the back of the pan, this can still work with limited space. It’s worth considering a short projection toilet as this means the whole unit doesn’t take up as much space. The Tavistock Bathrooms Q60 toilet has a projection of just 600mm and is a unique squared off shape. Now if you want to hide away your cistern and also give yourself an added bonus of a little shelf, a back to wall toilet is perfect. All that is visible in this set up is the toilet pan. Choose to build a fake wall and hide this away or use a back to wall unit. It also allows you to use either a flat flush plate in a design and colour to match the décor, or make your room high tech with a sensor flush, fancy right!? Choose a short projection pan, such as the Tavistock Bathrooms Micra to save yourself some extra space. 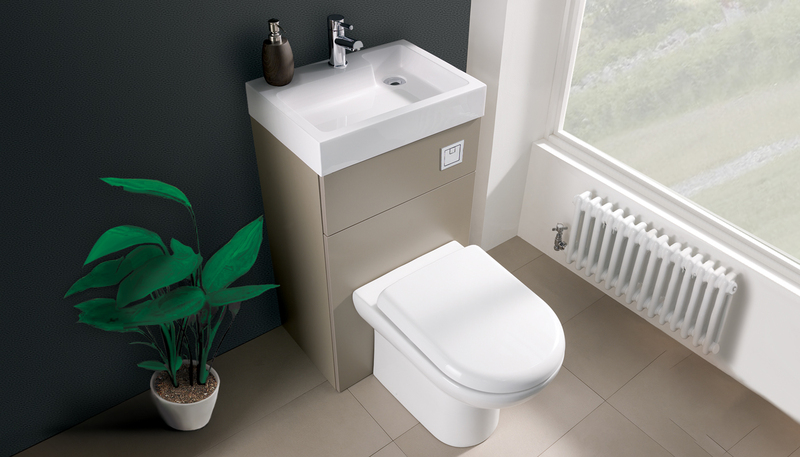 Another solution to a space problem is a corner fitted toilet, like the Laguna one above. Combining with a corner basin will really make use of every corner of the room, whilst using just a small amount of floor space. If you’re home doesn’t allow you enough space to fit even two of the bathroom essentials, then fear not. A combined toilet and basin, is the answer to your prayers. The benefit of this option is only one wall is used up, with space saving in mind, these items are designed specifically for under the stairs or that converted cupboard. Here at Bathroom Supastore we’ve got not only one but four options for you! The Athena vanity unit and toilet is the complete package. 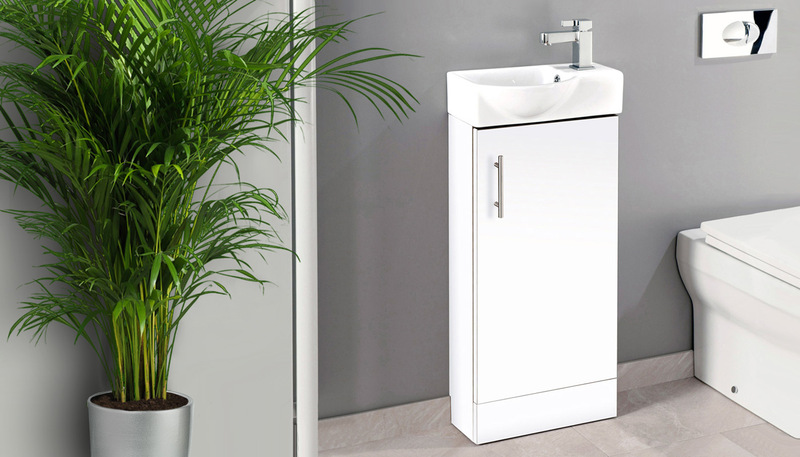 A sleek vanity unit, that comes in 3 beautiful colours, has wide yet slim line basin sat atop the unit. The basin has a cut out section designed perfectly for your soap, which is a very clever idea from the manufacturer, Premier. With its concealed cistern the Athena 2 in 1 is a smart choice. When you didn’t think it could get any smaller, we can introduce the 2 in 1 Close Coupled toilet. This clever combination has a basin on top of the cistern and can also produce hot water, unlike any other 2 in 1. Whilst this doesn’t look as impressive as the Athena, it’s certainly a genius solution for getting that second loo. Hopefully these ideas and options have inspired you to finally get that second toilet. To bring some sort of sanity to your bathroom and make it easier for all those family gatherings.